who first published my flash fiction, my second flash effort called Te Puna for her ongoing support and encouragement. Grab your copy now – a great gift to yourself or a flash-lover. Feelin g…greedy? The latest volume in the Pure Slush Books 7 Deadly Sins series is ready for you to sink your teeth into, including my flash fiction, Small Sweet Thing. Sometimes you just need a good read…Pulp Literature’s summer edition is out, including my story My Brother Paulie: A Domestic Space Odyssey – grab a copy here. Thank Team Pulp! second prize in the Maria Edgeworth Short Story Competition – and to the Pakenhams for inviting us behind the scenes into their home, Tullynally Castle, for a fascinating glimpse of her life. Dive in! Very happy to join Joanne Harris and other inspiring writers from across the UK in It Came from Beneath the Waves (edited by Matthew Pegg, Mantle Press) a new anthology of strange sea tales. I went foraging for a good photo of a kelp-laden New Zealand shore and found this great close-up shot of our native Rimurapa holdfast by botanist Phil Garnock-Jones, which appears in the blog supporting A Forager’s Treasury – A New Zealand guide to finding and using wild plants– a delicious book by Johanna Knox – thanks Phil and Johanna. uncover the secrets and strangeness beneath the surface of everyday existence. My award-winning story, The King Tide, is set in New Zealand in the 1820’s, inspired by the role of the sea in countering the tyranny of distance and it opens and closes on the kelp laden shore. She is in fine company with the post-apocalyptic weirdness of Carmen Marcus’ Bight, Tomcat and the Moon, the contemporary horror of Eqalussuaq by Tim Majors, and Joanne’s folk tale The Selkie. On sale now for £7.99. Check out Rupert Dastur’s review of Dusk in The Short Story Review my story MacFarquhar’s Bed gets a special mention too. Dusk (edited by Cherry Potts) brings together the stories and poems from the Solstice Shorts Festival and you can pre-order yours now – publishing in June 2018.
sporangium. Operculum, calyptra and gemmae. With a squeal of the factory siren, I’m proud to say that my story, Bystander (what would you do?) – is up at with some great writing, as part of their Citizen series. Thanks team Word Factory. my story is set in the early nineteenth century in far northern New Zealand. Editor, Matthew Pegg, is promising stories with a vivid atmosphere and a sense of the strangeness lurking beneath everyday reality. Like many children around the world, I grew up reading stories about Tarka the Otter (first published over ninety years ago, in 1927), so when I won the Crediton Short Story Prize and a stay at the Lamb Inn in Sandford, I was thrilled to be coming to Devon. Appropriately enough, my story Entanglement, is all about creeks and foraging and fishing and memories. Big thanks to the Crediton Town Team who organise the competition, and Nick and Nat and the Lamb Inn team for their great hospitality and such a relaxing stay. And to Dave, for a classy cheese-board (paired perfectly with an Otter ale) and the world’s best rhubarb crème brulee. Entanglement, the winning story, is currently scheduled to be published in Riptide Journal (editor: Sally Flint) this summer. Happy St Patrick’s Day – and in the festive spirit, my short story about green things and blended families, The Real Thing, is over at Fictive Dream Thanks ed. Laura, promise no shamrocks were harmed in the making of this story. Alphabet Soup and Crow Funeral. Thanks Jen and the rest of the Pulp Literature team – and judge Bob Thurber for your support and encouragement. Alphabet Soup has an honourable mention and you can read Bob’s comments here. An Epic Mistake, about girl writers, role models and displacement. In great company with other writers and poets and a fine cover. Kia ora, Lesley and Gerri Kimber. Big TY Maryam Madani for her shoutout for my short story, in her review for Totally Dublin. stacked with a stunning array of quality writing,” says reviewer Aran Singh over at New Pages, who describes Tillie Olsen finalist, The Road to Leongatha, as “a snapshot of a moment in a family’s life, a coming-of-age story for a young girl, presented in prose so direct and visual that the whole thing feels effortless.” Thanks publishers, reviewers and readers. Much wooting and a big thanks to Dublin UNESCO City of Literature @DublinCityofLit for naming The Broken Spiral anthology (ed. RM Clarke) as one of their Reads. Lovers of great writing – the anthology of hopeful writing in support of crisis counselling at @DublinRCC includes over 20 authors please visit @BooksUpstairs @DubrayBooks or http://www.thebrokenspiralbook.com/where-to-buy/ Cheers. is in the special 1k edition of Flash Frontier – where my second ever flash was published. Double Happy! Festive gratings and crumbs! Why have a mince pie when you can feast on my short story, Silver Linings? Fudge brownies and love take a dark turn over at the elegant Fictive Dream. Thanks ed. Laura Black. Enjoy with a hot beverage of your choice. Laura says: “American writer and teacher, John Gardner’s concept of the fictive dream remains a cornerstone of good writing. Powerful writing ensures that readers never slip out of the fictional world or dream that a writer creates.” So now you know where the name came from. You’re welcome. Spooky possum! My story, Just Right for Evie, about two wrangling sisters is a finalist in the Field of Words – Haunted – short story competition. Thank you @arachnepress.com – my story MacFarquhar’s Bed has been chosen to be performed at Ellon and Inverness as part of the Arts Council England-funded Solstice Shorts Festival 2017: Dusk A Wave of Words Across the UK: Stories, Poems and Songs coming simultaneously to 12 venues across the UK 21st December at Dusk 17:07-18:20. Not to be confused with Tracey Emin’s bed…MacFarquhar’s Bed is a geological feature on Black Isle, and the stuff of legend. Sneaky peek? When the Call Comes, my story about the extraordinary, driven, plein air Scottish painter, Joan Eardley, has won the HG Wells Grand Prize. It will be published in Light: the HG Wells Prize Anthology, but you can read my story and the other winning stories here. Louise O’Neill, Claire Hennessy, Geraldine Mills, Eoin Dolan Lane, Rosaleen McDonagh, Fiona O’Rourke and Sam Blake. All proceeds go to support @DublinRCC. Details of how you can grab yours here. Something to crow about…my story, My Brother Paulie: A Domestic Space Odyssey is runner up with an honourable mention in Pulp Literature’s Raven Short Story Competition. Born at @KitdeWaal’s great Bath Flash Festival workshop – thanks Kit. Judge @brenda_carre says, “this is a very short, tight flash exploring the narrator’s somewhat whimsical, rather dark understanding of her brother’s altered state.” Out soon. That feeling when…your work is a finalist in a competition honoring a writer you’ve admired for yonks…the Tillie Olsen Short Story Award. Thank you very much,The Road to Leongatha will be published soon in The TishmanReview. Without a word of a lie and only a smidgeon of creative licence, Wiser [Truth Serum v2] is out now, edited by Matt Potter at Bequem Publishing. My short fiction, Best Bad Influence, is in fine company with stories from around the world. You can grab a copy here and eBook versions follow soon. judged by Kit de Waal. The winner and runners-up will be published and available for audio download on October 23 2017. James Norcliffe. Stand by for pruning! Orla McAlinden (aka @OrlaMcAWrites) is up over at The Short Story Review (thanks, Rupert). 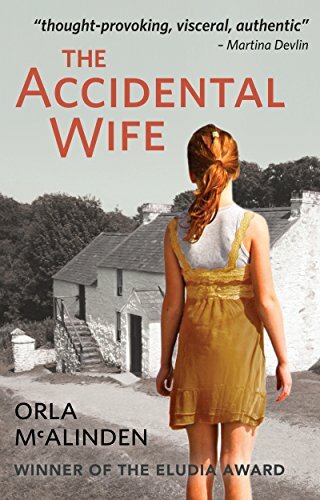 And, The Accidental Wife is out now on Kindle too. My brambling story, Women’s Business, is a finalist in the Field of Words flash competition – you can read it here. Thank you. That feeling when the picture goes so well with the story :D…thank you Chelsea Laine-Wells aka @chelsea_l_w and Hypertext magazine – my short fiction New Girl is live now. This story carries an eel-warning – you can read it here. Many thanks Writing East Midlands and Jacqueline Gabbitas and the hosts on National Writing Day, the very special Bromley House library – my story Pilgrimage is highly commended in the Aurora Short Story Competition, alongside Loving Icarus which was commended. You can read it with other finalists in the anthology Cut the Clouds. Delighted to join hosts Sophie Haydock and Zoe Gilbert and guests Rowena Macdonald and Tamsin Cottis and more, to read my story By-stander at the Word Factory #54 Not The Election, part of the Citizen: The New Story season. Bring a friend for free and come and hear some timely stories – tickets just £5 here, bring a friend for free – Wed 7 June 2017, 19:00 – 21:00 BST at Embertons Cafe, Waterstones, Piccadilly W1J 9HD. Thank you @LiterallyStory – my short story, A Little Kismet, about writers, favours, and modern match-making is over at Literally Stories. Thanks Laurie Garrison founder of The Women Writers School – really interesting interview about the Sixth International Hysteria Writing Competition, including how the comp got started & more…check out the great pic too ;D.
Feel like some pocket-sized fiction? My new flash fiction On the Verge is in fine company with other 250 word stories in the April [Pocket] edition of Flash Frontier. There is nothing like a dame, as the song goes, so my new blog as writer-in-residence for @UKHysteria brings you a real dame of literature, and six other acclaimed, award-winning class acts who write and judge short stories. Big thanks to our eight stellar short story collaborators this year: Danielle McLaughlin Alison Moore, Dame Fiona Kidman; Kirsty Logan; Tania Hershman; Vanessa Fox O’Loughlin and Sinead Gleeson for generously donating their time and over twenty pointers – plus, there’s a great story generator from the Chief Editor at Fish Publishing, Mary-Jane Holmes. The Sixth International Hysteria Writing Competition is open till 31 August 2017 and includes flash fiction (250 words); short stories (2,000 words) and poetry (20 lines). Thanks everyone for your enthusiasm, great feedback and re-tweets too :D.
fifty-four writers, is available for pre-order. Includes my story about a clootie well, The Orchard of Hopes & Dreams. For the latest, follow @AFuriousHope and www.facebook.com/furioushope. My latest blog as writer-in-residence for @UKHysteria is all about flash fiction, bringing you 18 top tips and a great story generator from award-winning women writers, editors and judges around the world – @kathyfish; @KitdeWaal @NualaNiC; @nodghosh @megpokrass; @authorzoesharp. In fine company on the inaugural 2017 Bath Novella-in-Flash Award shortlist with 37 Foolish Things. Congrats and great good luck everyone – and big thanks to the well-organised team at the Bath Flash Fiction Awards. Finalists are published in the Hysteria 6 Anthology at the end of this year, ISBN number and all. Entries open 01 April and end on 31 August. Over the coming months, a dazzling array of women from around the world are joining me, generously sharing their best writing tips and some exercises to help you whip your work into shape for the competition. And my Ten Tactics for Writers is here. just sign up for the newsletter. Happy writing – I know the judges are looking forward to reading your work! Delighted to have three stories in Carry Her Home, the first Bath Flash Fiction anthology, edited by Jude Higgins and Ad Hoc Fiction. Nocturnal, about a night out, for the late, great Arthur Tauhore (07/10/1958 – 28/11/1993); Ten Bucks Used To Buy You A Lot, about Mary Doyle Keefe, the woman behind Rosie the Riveter, and Rules – for all the motel cleaners out there. My review of Alice Kaltman’s darkly funny debut short story collection about post-crash America, Staggerwing, is out now, over at The Short Story . My noirish story about predators, The Girl in the Kiss, is out over at Spelk Fiction. Two new stories in the latest issue of Halo Literary Magazine, themed Embers . Scratching the Matchbox, which takes its title from a phrase Virginia Woolf used in her diary about getting a conversation going which “brings together simple, everyday associations in a gently poignant story.” Free to Roam is dedicated to Portadown author, Orla McAlinden. Set against a backdrop of segregation, the story “captures perfectly the sharp bite of teenage insecurity and competitiveness.” You can pre-order Halo here. Thanks Lorrie and team, and Ruth Thorp for fine cover art. Noble Gas Quarterly, Issue 203.4 – “And, the body snatchers are only doing their job” – Perishable and The Court Jester. Thanks NGQ and Sara Iacovelli! with a bunch of talented writers. You can read it online, download it or read it on Issuu – if you enjoy this issuu, your donation is welcome. Thanks Spencer! An award-winning writer, I work across genre and form. I’m currently completing an historical literary fiction novel. I’ve lived in both hemispheres and worked around the world in all kinds of weird and wonderful jobs – mostly to do with stories in one way or another. My stories regularly appear in assorted journals and anthologies around the world. and shortlist for prizes.